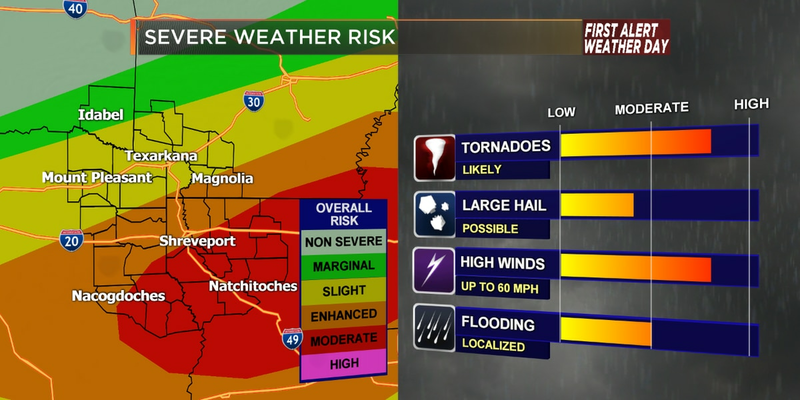 Population centers in the zone of greatest risk, 4 out of a possible 5 on the Storm Prediction Center's scale, include Monroe and Alexandria, Louisiana. Multiple people were injured and several homes were damaged in Hamilton, Mississippi, said Monroe County Coroner Alan Gurley. In addition to the potential for tornado development, the strong line of storms will also produce damaging winds and heavy rain, capable of producing flash floods, particularly in Arkansas and parts of MS and Alabama. Earlier, two children died in East Texas after a tree fell on their moving auto. The 13-year-old boy drowned in a drainage area in West Monroe late Saturday afternoon, the Ouachita Parish Sheriff's Office said. The fire station in Hamilton was destroyed, as were multiple homes and a retail center. In addition to tornadoes, many of these storms featured heavy rain, large hail and damaging winds. Trees were down throughout the hilly city on a bluff overlooking the Mississippi. At Georgia's Augusta National Golf Club, organizers of The Masters golf tournament moved up tee times Sunday to try to beat unsafe weather. "We are just a mess".